Looking for a way to add more protein, calcium, and fiber to your diet? There’s no better way to do that than with these easy kale salad recipes. Of all the healthy greens, kale is king! It is among the most nutrient-dense foods on the planet. Reduce your risk of chronic disease: The immune-boosting carotenoids in kale help protect cells from the DNA disruption and oxidative stress that can, over time, increase your risk of chronic diseases like diabetes and some cancers. 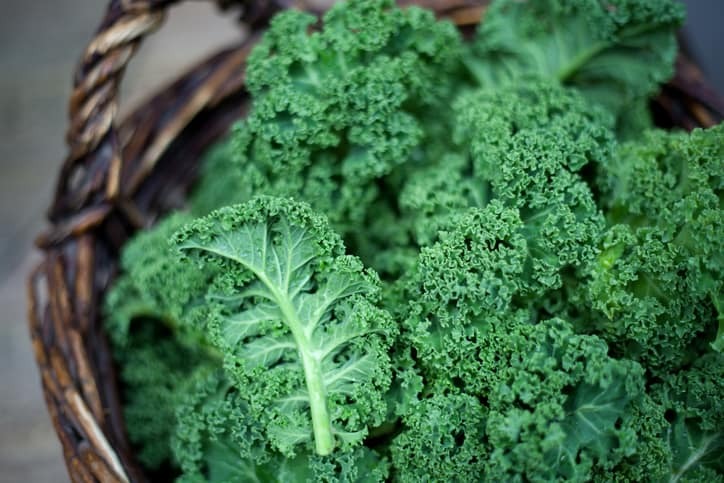 Protect against vision loss: Just one cup of kale has more than your whole day’s worth of the carotenoids lutein, zeaxanthin, and beta-carotene, which help shield ocular tissues from harmful UV damage and may reduce your risk of cataracts. Help lower blood pressure: The potassium, calcium, and magnesium in kale and other veggies help counterbalance the effects of sodium that can lead to hypertension. Kale has been called the angry lettuce, because is it much more fibrous and less delicate than say baby spinach, romaine, or other leafy greens. The good news is that you can eat kale raw in a salad with one easy trick. 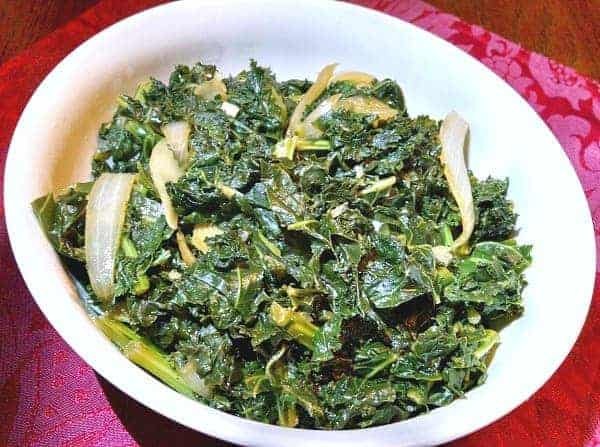 I have found that massaging kale with lemon or orange juice and a little sea salt make it much more tender and flavorful. And who can blame it? We all could use a little massage to soften our attitude every now and then! Massaging kale only take about 2-3 minutes. How long should you massage kale? Surprisingly, it only takes about 2-3 minutes. Though the stems are edible, they are the most fibrous part of the plant, so I advise taking them out to make a more delicate dish. One thing I’ve noticed with the pre-cut kale in bags is that the leaves are sliced horizontally which causes the stems to be included in them. The stems are so fibrous that it’s best to take them out for most recipes. Those cut bags of kale are great for things like smoothies, but not so much for raw kale salad. I always buy the whole leaf kale and de-stem it, because it only takes a few minutes. Destemming is not difficult and doesn’t even require a knife or scissors. 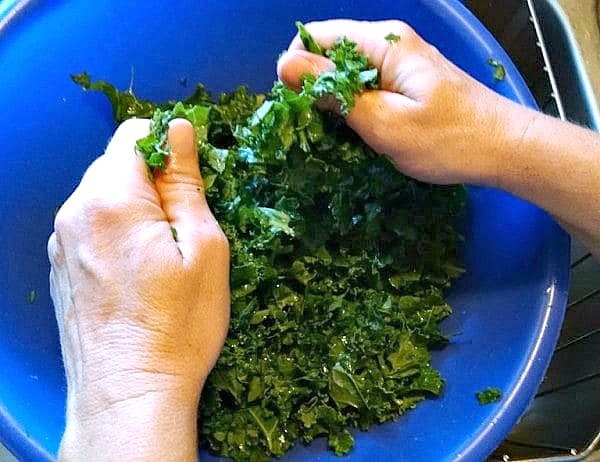 To strip out the stems, simply grasp a kale leaf with one hand by the stem. Wrap your other hand firmly around the lower end of the leafy part. Slide your hand up the leaf, staying close to the stem, to strip off the leafy part. There is even a kitchen tool called Loose Leaf Kale, Chard, Collard Greens and Herb Stripper to make it very simple. 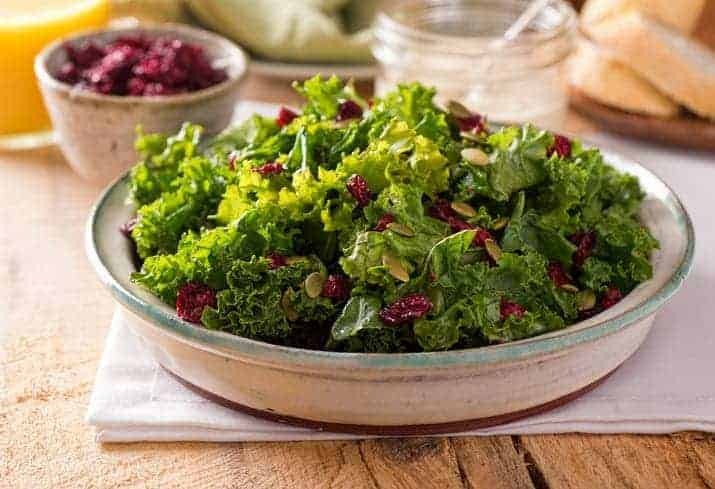 From massaged kale salad recipes to kale quinoa salad recipes, we love kale salads, and these are some of our favorites! This Kale Quinoa Salad with Orange Miso Dressing is crazy delicious and so easy to make. 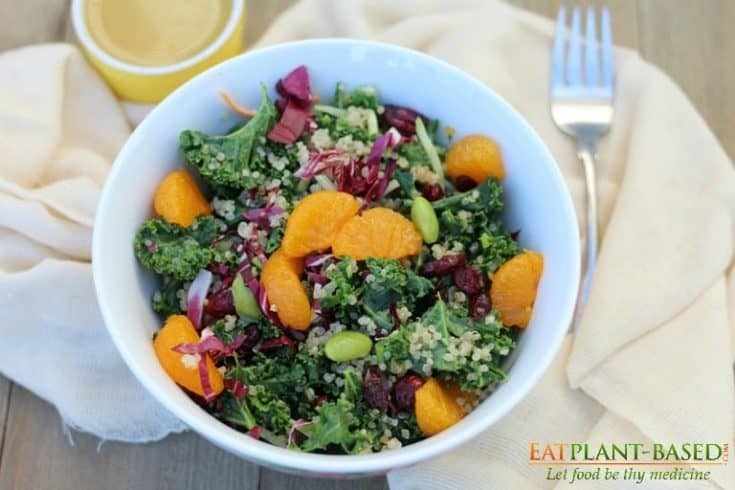 An amazing nutrition powerhouse salad of kale, quinoa, mandarin oranges, and so much more! 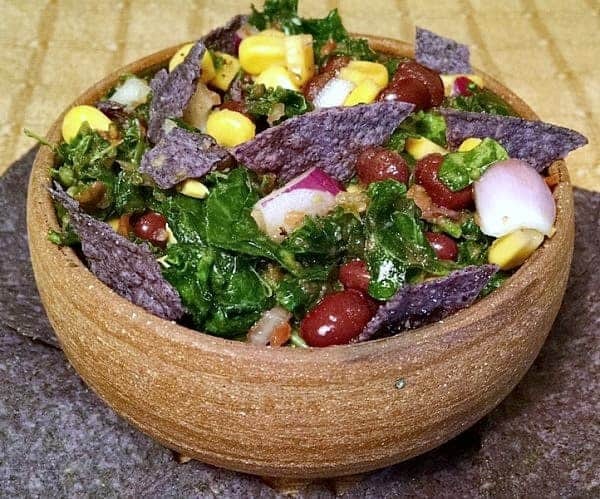 When I teach KickStart Your Health classes for Physicians Committee for Responsible Medicine, this Mexican Kale Salad is one of the favorite recipes. Even a classroom of high school students lined up for seconds, and only 1 out of 25 had ever had kale before! Kale has been called the angry lettuce, because is it much more fibrous and less delicate than say baby spinach, romaine, or other leafy greens. But, this massaged vegan kale salad demonstrates an awesome trick to calming it down. This is our favorite way to eat cooked kale, and it's very easy to make! Braised Kale is delicious and power-packed with protein. Most kale salads will keep a few days in the refrigerator for a nutritious lunch option or a dinner side dish during the busy work week. 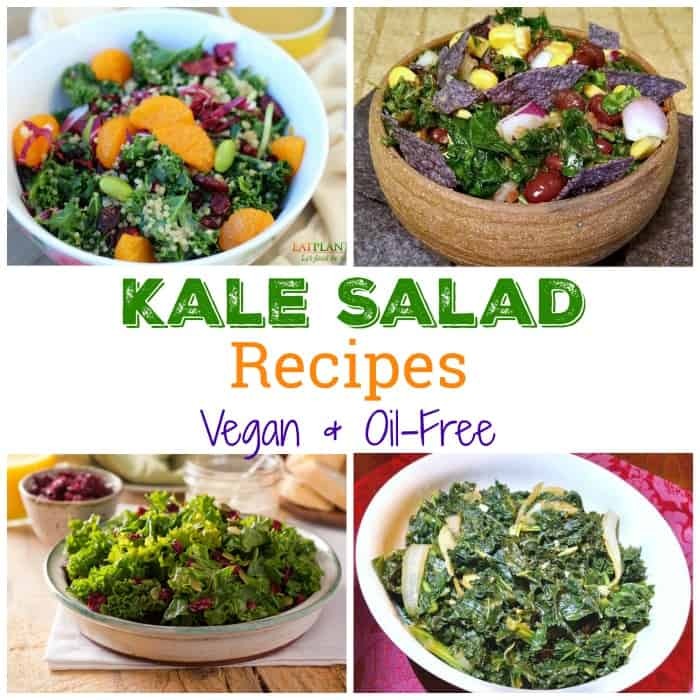 For more kale recipe ideas checkout our kale category page. Great way to keep a healthy lifestyle on track and keep you feeling amazing! Click photo above to see Starter Kit options and content. Choose which book comes in your kit. $27 plus shipping & handling in US only.